Florida traffic school, or Basic Driver Improvement (BDI), is a course you can take if you have received a Florida traffic ticket for a moving violation such as speeding, running a red light, or following too closely. Many drivers voluntarily attend a Florida traffic school course to remove ticket points, which in turn prevents their insurance rate from increasing. This insurance benefit is found in Florida law (§626.9541[o],F.S. ), and it applies to the majority of drivers. All drivers who are eligible to attend Florida traffic school can take their course on the Internet to save time and money. You can sign up for your online BDI course today by clicking on the green "GO" button. "I took this course for a speeding ticket I got on I-95. I regret getting the ticket, but your course really made me think about how I could improve my driving, which is a good thing." Please read the Florida traffic school FAQ for additional course information and attendance restrictions, or contact us if you have questions about the course. The DHSMV approved online Florida traffic school course contains six units that you complete at your own pace. When you register for the course, you receive a login code that you will need to log in and out of the course. Every time you log out, we store your course activity on our server, so you never have to worry about losing your work. The course takes about four hours to complete and uses video, animations, text, and graphics to teach defensive driving concepts. You will learn how to control your Attitude States behind the wheel so that you can avoid future traffic tickets and crashes. After the last unit quiz, you must verify your delivery options before a certificate of completion will be issued to you. 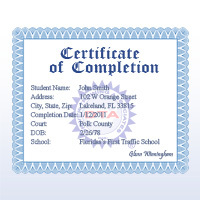 While we do report traffic school completions to the State of Florida, most drivers are also required to turn in a signed, original completion certificate to the clerk of the court for the county that issued their ticket. Please note that it is YOUR responsibility to make sure your completion is reported to the appropriate authority on or before your court-appointed due date. If you select the free certificate delivery option, you will receive your completion certificate via U.S. mail. If you select the electronic delivery option, you will be able to print your certificate from your computer after you pass the last unit quiz and confirm your delivery options. A copy of your certificate will also be e-mailed to you in PDF format. For questions not answered on this Florida traffic school details page, please consult our extensive Frequently Asked Questions page.